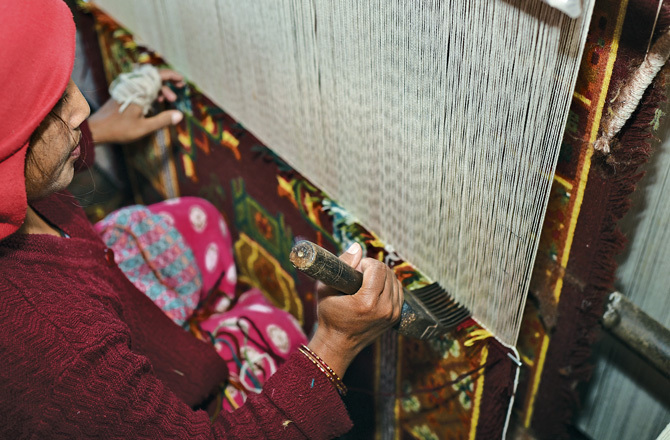 Carpet weaving in Nepal had once blossomed and become one of the country’s largest export industries. 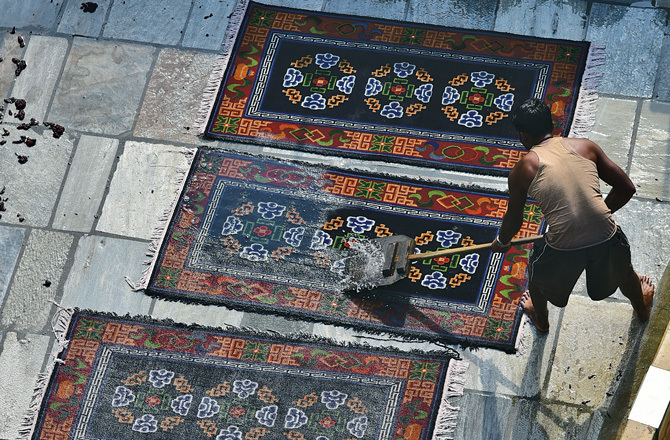 Although the business in recent times seems to have gone downhill, Nepali carpets have made their name worldwide. 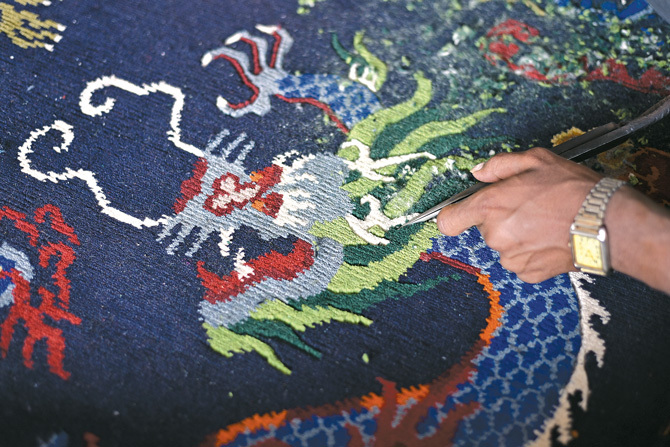 And therefore, when talking about Nepal’s craft, a world of colorful carpets cannot be left behind. It’s an idle winter afternoon, the song playing in the background reminds me of my childhood when I slept on my terrace, enjoying the warmth of the sun that touched my face. Besides me, my sister peeled an orange to relish the perfect tanginess that winter needs, while my mom who is obsessed with cleaning, started picking up the seeds that my sister had carelessly dropped on the Tibetan carpet. This carpet was large in size, and was a kosa (gift) my mom prized. Tibetan carpets have been a part of many people’s childhood, and therefore, they now ingrain nostalgia. 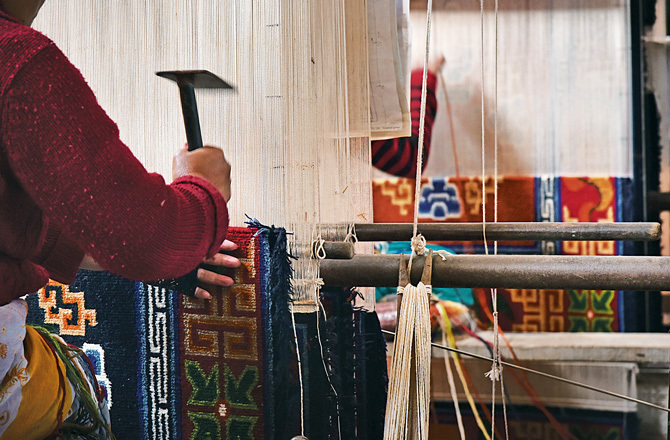 In the Jujung Dolma Carpets factory, I was overwhelmed by own fogged memories. 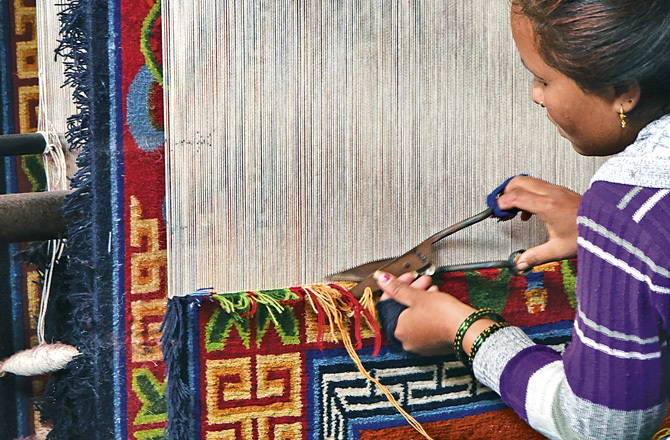 As I sat there watching the work of the craftmakers, I realized I never considered their work when I slept, played, jumped, and rolled in the dozen of carpets lying around in my home. Nor have I ever thought about the hard work that making a single carpet needs. Someone once said to me, “To appreciate craft one needs to know the craft process,” and it’s quite true. A carpet isn’t a one-person craft. It is a work in which a dozen individuals contribute. The work starts when a designer somewhere in an urban office conceives a design and then sends it to the carpet industry, where each worker is given a graph or map of the design to follow. Here, a wooden structure (tar) is used to weave the knots. A continuous knot is sewed across the entire width thereafter, and the process is repeated and added one after another until a pattern is illustrated. 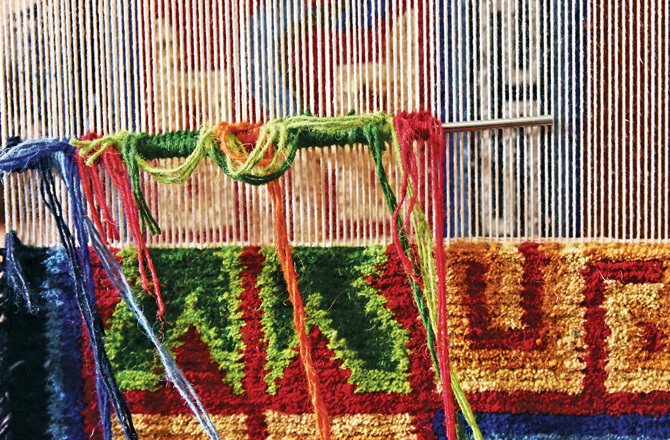 Usually, carpet weavers create different patterns by alternating different colors of yarn on a specific count as they weave. It almost sounds like they are writing with a typewriter. 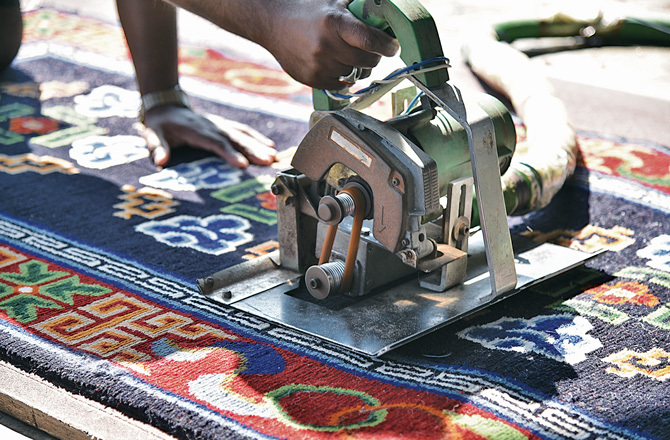 Once the weaving is done, the carpets are then inspected and sewed individually to craft a clean product. However, the process doesn’t end there. 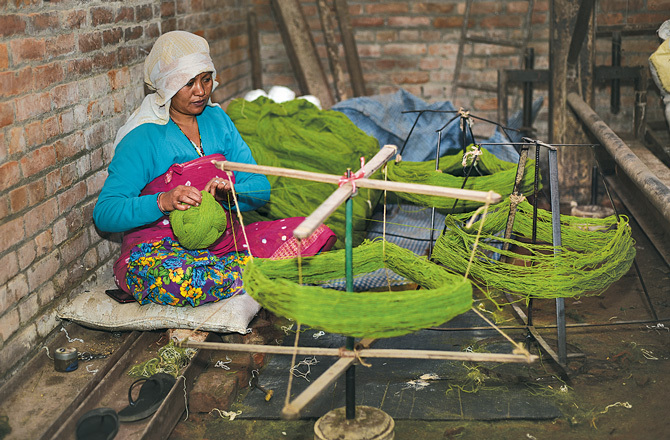 In some cases, the laces are woven and covered with jute threads. As I stood there observing the rush of the carpet factory, I realized the ignorance I have lived with all my life. So much effort goes into making a craft, and so much is left unsaid about it after it is manufactured. And, so easily we approve and disapprove them according to our choice. While there were more than 10 small carpet industries in Sunakothi 10 years ago, today Sunakothi has only four small carpet industries. 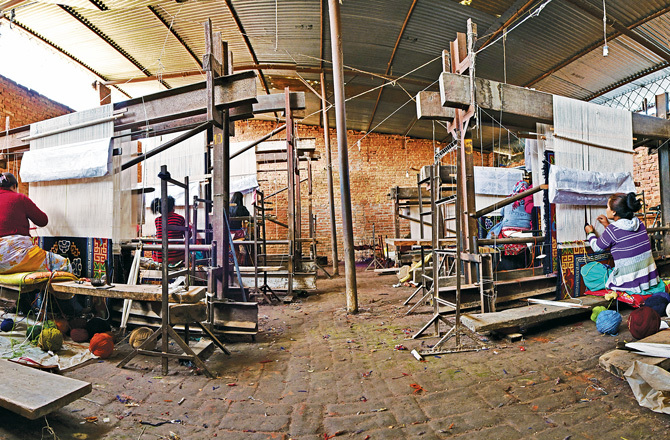 Prajwal Maharjan, who represents the younger generation of Jujung Dolma Carpets, estimates that the carpet industries in Nepal probably won’t survive the urban wave. “However, the small industries could shift to the rural areas,” he adds. Much of their production is exported to India, Tibet, China, and Indonesia. But, it’s an irony that we who have brilliant carpet weavers in the country chase after Western products when decorating our own homes. Additionally, it’s undeniable that the carpet industries in Nepal have given us a lot of beautiful memories: one being the sweetness of our childhood.